We left Namche Bazaar for about a 4 hour hike to Khumjung. It started with a steep uphill climb that covered the same part of the hike we went down the day before. We retraced back over the landing strip and then headed over the hill. 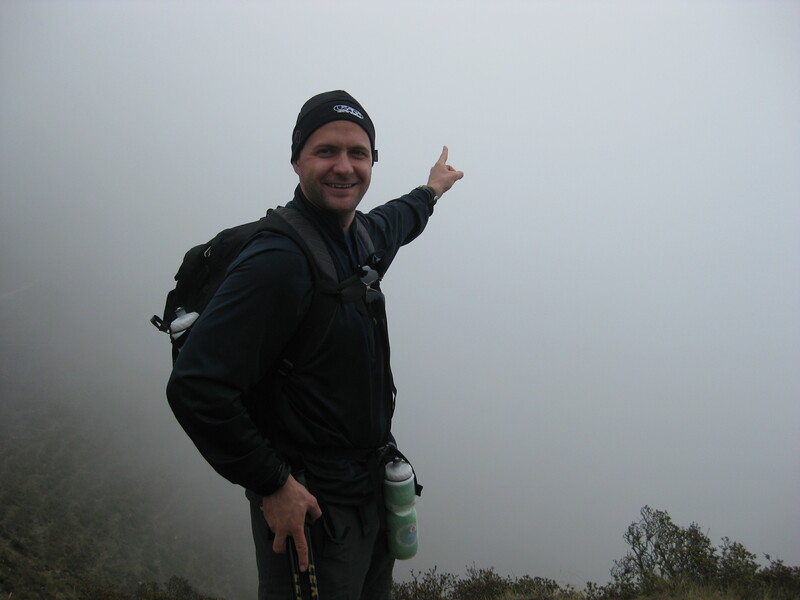 This was going to be our first sighting of Mt Everest, however, there was a thick fog so we did the best we can to show you a picture of where the peak would be, see below’s picture. About 2.5-3 hours into our hike, we came upon a 5-star Japanese resort that was supposed to overlook Everest. 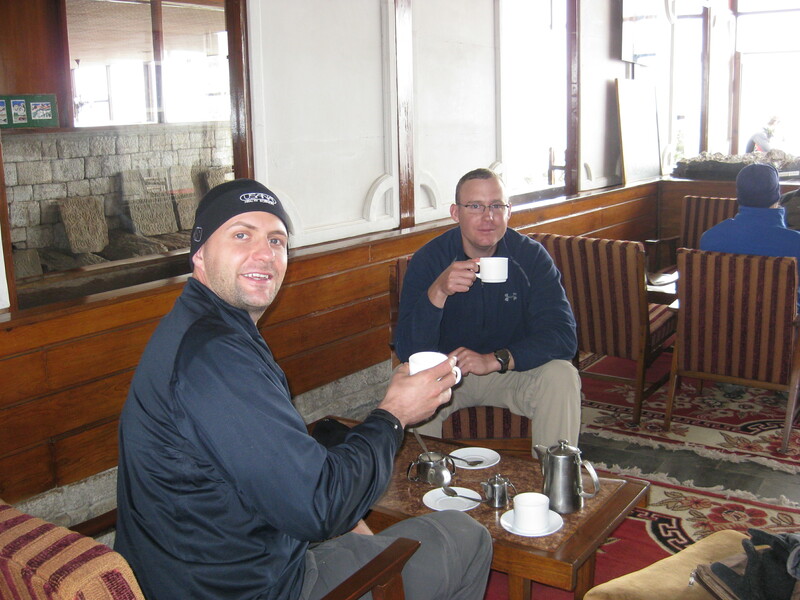 Again, the clouds blocked us, but we had a great chance to sit and enjoy a nice pot of coffee along with some hot nuts! See below for a nice picture of us relaxing. 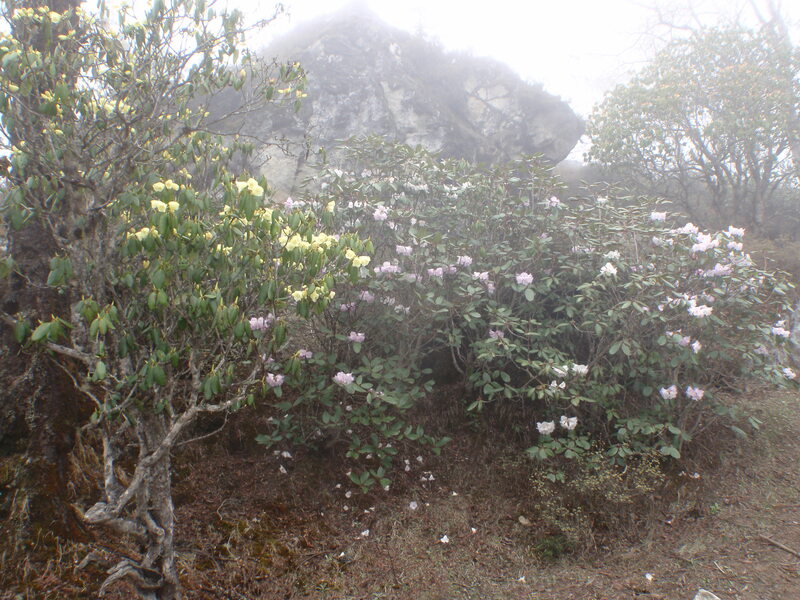 From there we headed through a forest and/or garden of rotadendrum’s on our way down to Khumjung. Check out some pictures of that below. 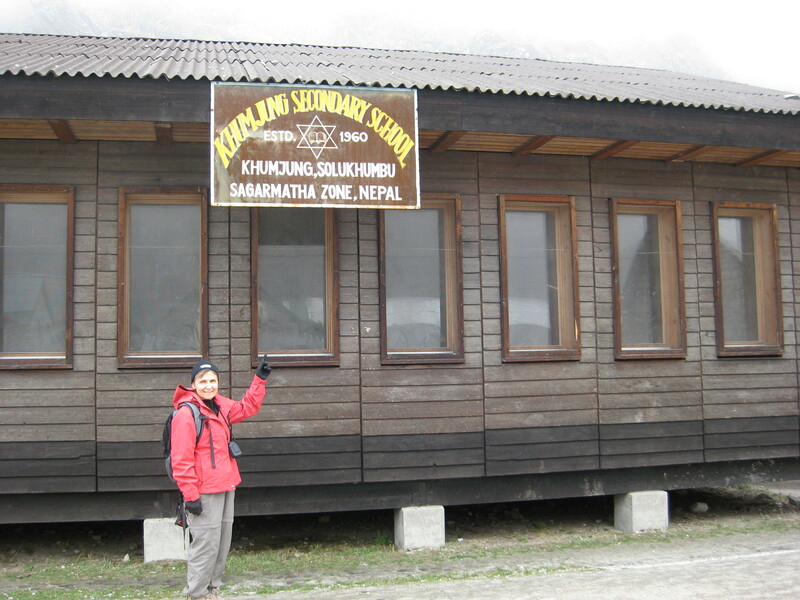 Finally, we arrived at Khumjung. 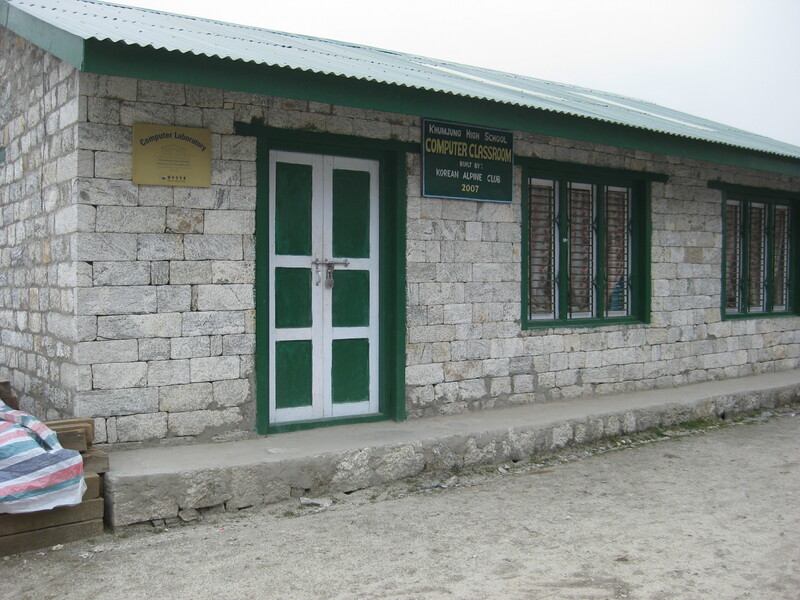 There is a high school here where people from all over the world have donated both time and money for it to remain in existence. Children hike as far as 2 hours each way to get here (up/down hill). So, when your parents tell you that they used to walk so many miles uphill both ways in the snow to get to school, these children actually do! Before dinner, Brian and Chris got together a team of tourists to take on the guides for a game of volleyball on the gravel. The guides won 2 out of 3 but it was very close. This definitely winded us quite a bit since we were playing at an altitude of nearly 12,500 ft.
After dinner we were treated to some local singing and dancing. A local women’s group came to our cabin and sang some traditional music with some traditional dancing. They then joined with our trekking guides and did some Nepalese music and dancing where nearly everyone participated. Check out Mom busting a move! It was at this point that several people showed symptoms of mild to extremely severe food poisoning and/or “traveler’s” diarrhea. One thing you should be sure to ABSOLUTELY have prior to traveling out of the country is a prescription of Cipro. This is a very potent anti-biotic and is useful in times when you come across a bacteria infection introduced by food. You can typically obtain this by making an appointment or phone appointment with your personal physician. My physician also recommended a Z-pack or a prescription of Levaquin for anything upper respiratory or sinus. * Everyone on your trip should not need their own prescription because ideally you will not all get sick but be sure you have some available. * These statements are not intended to diagnose, treat, or cure any disease. Today was our acclimization day in Namche Bazar. Basically the goal is to hike very high, hang out, and then climb back down and rest for the rest of the day. Going up high gets the body to start the process. I believe we start making more red blood cells, etc. so that the body can handle less oxygen being taken in. We started the day with a nice café Americano at the rooftop café that overlooks the town and the mountains around us. Below is a video to introduce the day. If you listen carefully, you can hear the local music along with the clicking of the rock hammers from all of the builders in the area. 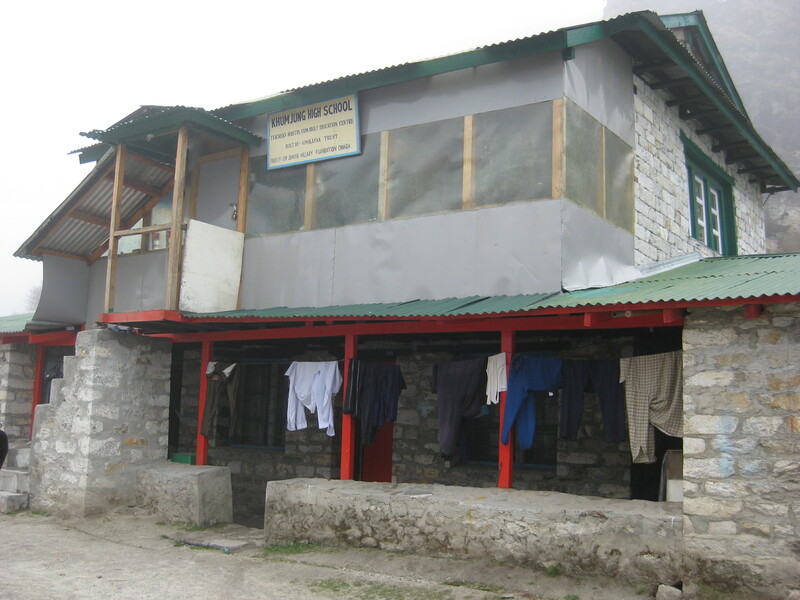 Basically we went up to the Hillary Museum, a small little museum in honor of Sir Edmund Hillary. Sir Edmund was the first person to summit Mt Everest and has done some amazing things to build up the region and help the local people. From there we climbed up the mountain that was above Namche Bazar which was approximately about 1000 ft above the town. We needed to stay here for an hour to get our bodies to start adjusting. 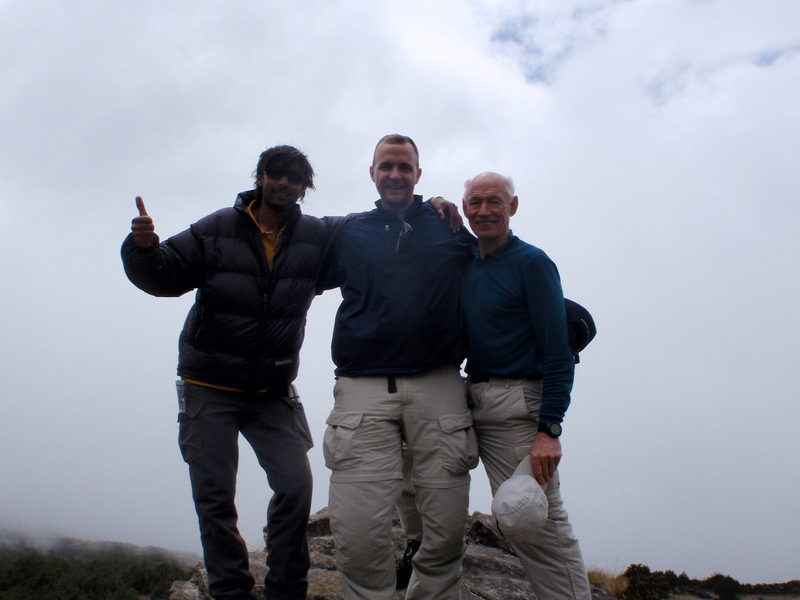 We had a chance to hang out with Werner Berger, the oldest North American to summit Mt. Everest and a huge visionary for creating peace in the world. Below is a picture of Chris, Werner, and the lead guide Kappy. Beyond that we have a nice video of Mom and Chris below to recap the day. 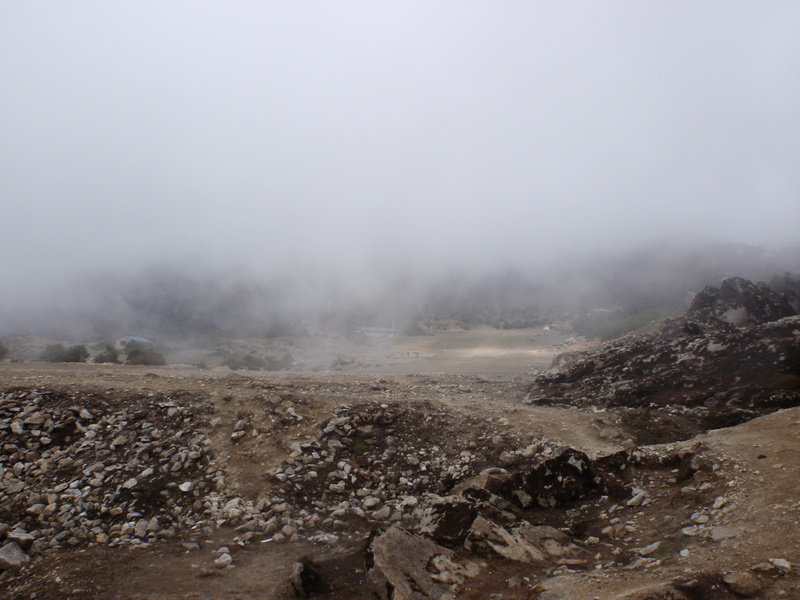 You can get an idea of how high we went to acclimatize. As far as dinner goes… We’re on the high-glycemic program out here. There were lots of potatoes, veggies, rice, and even pizza this night! We’ll see you all on the next posting. When individuals ascend from sea level, it is recommended that they spend at least one night at an intermediate altitude prior to ascending to higher elevations. In general, climbers should take at least two days to go from sea level to 8,000 feet (2,438m). After reaching that point, healthy climbers should generally allow one day for each additional 2,000 feet (610m), and one day of rest should be taken every two or three days. Should mild symptoms begin to surface, further ascent should be avoided. If the symptoms are severe, the individual should return to a lower altitude. Some reports indicate that acetazolamide (a diuretic) may be taken before ascent as a preventative measure for AMS. Paying attention to diet can also help prevent altitude sickness. Water loss is a problem at higher altitudes, so climbers should drink ample water (enough to produce copious amounts of relatively light-colored or clear urine). Alcohol and large amounts of salt should be avoided. Eating frequent small, high-carbohydrate snacks (for example, fruits, jams and starchy foods) can help, especially in the first few days of climbing. We all awoke early for the toughest hike of the trip. This is a 6-8 hour hike depending on speed and has an elevation change of 3000 feet. 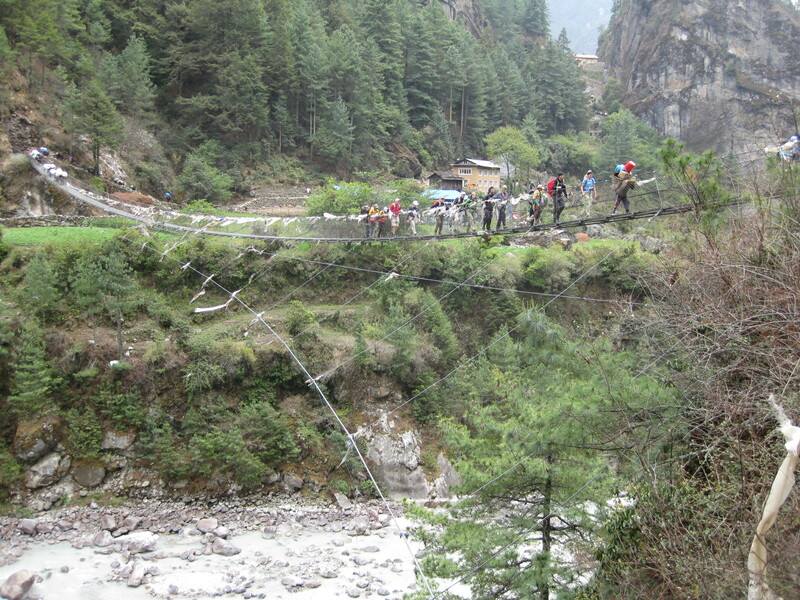 The trail entailed crossing 5 suspension bridges. Not quite the trail if you are afraid of heights but it does build confidence. The early part of the hike winded along the Milk River and was the easiest part of the hike. Here is a video of the Milk River at the beginning of our trek. After our lunch break and many other bathroom breaks (part of the joys of traveling with 40 people) we embarked on our toughest part of the trek. After crossing the 5th suspension bridge which was the highest of all them, we ascended 400fmeters to our first rest stop. This part of the trek separated the men from the boys you might say or those who prepared physically for this trip and those who underestimated the physical challenge of the trip. We were happy that our training and hours spent at the stairs had paid off. After our rest and waiting for others to catch up, we ascended the last 200 metersto our destination, Namche Bazar 11,000 feet. So basically we climbed over half a mile up one day. 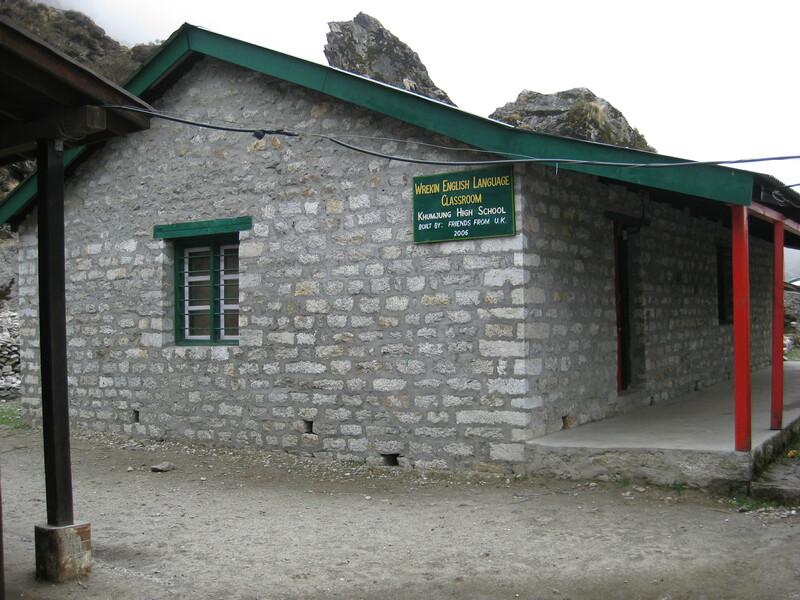 This is the resting spot for almost all trekkers. Every team that does Everest stays here to acclimate. 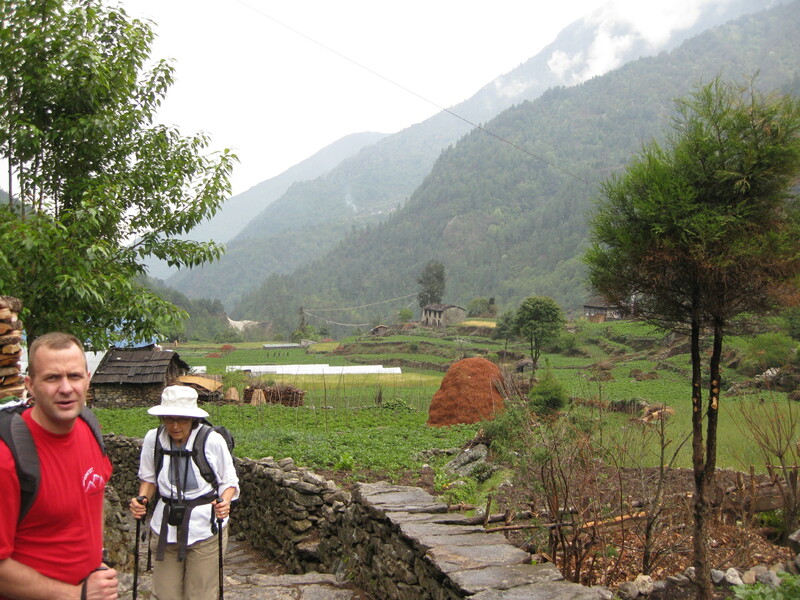 Acclimation begins the next day with a trek up for 2 hours and then returning. We are very delighted to enjoy a HOT shower – we stink. 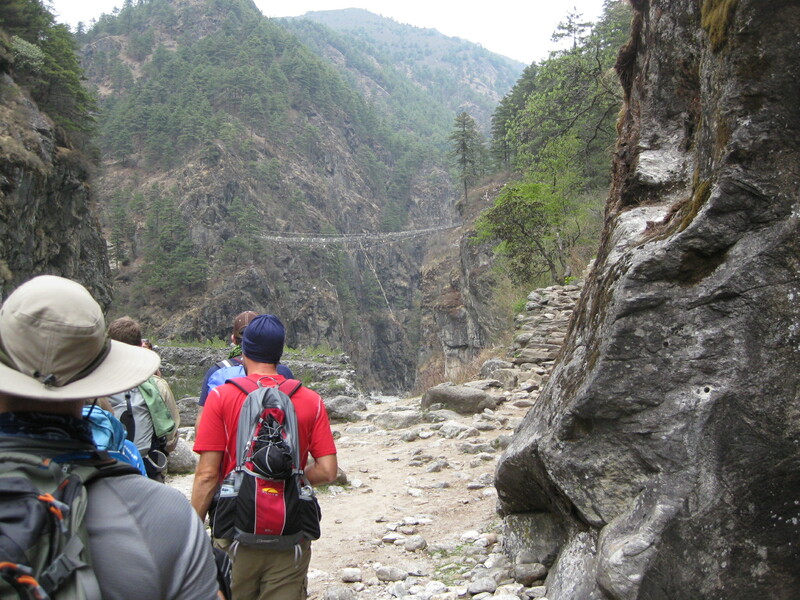 This is one of 5 suspension bridges we crossed for the day! If you look at the top peak of this picture on the right, we are hiking to this peak! We awoke at 3:30AM to get our bags ready. Breakfast was served at 4AM and everyone barley slept but was full of excitement for the day ahead. Due to the strike we had to be sure to leave at 5AM to catch the early flights to Lukla and to avoid any potential dangers. Here is a great picture of the huge jet! We landed on a very short runway. It is less than a football field and only recently was it paved! 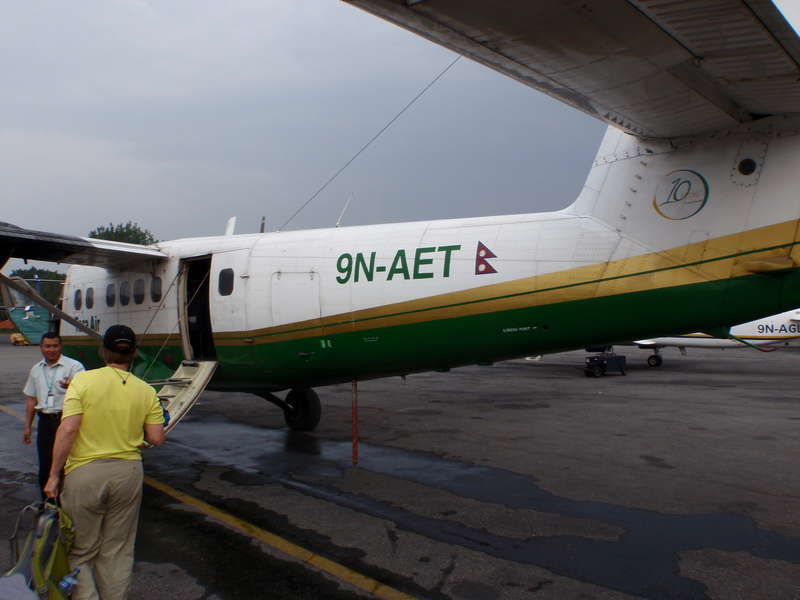 Our group used three planes and all landed safely in Lukla. Now the trip begins. Check out a video of the runway below…. And yes, we take off from this runway on the way back to Kathmandu! After the flight we all gathered for some tea at a local tea house. Everyone purchased last minute items and with the slight rainfall we definitely needed some pack covers. The excitement and anticipation of the hike was all over the place. The group had a short 3 hour hike to Pahkding where we would be staying for the night. Kappy, our lead guide, had us divide into three groups to make the trek more efficient. So, here are a couple pictures of the scenery and what our hike looks like. It was absolutely amazing. I’m not sure the pictures can really even do it justice!!! Actually, just one picture… internet is so slow and we need to work on the next post! We passed over some sewage rivers that were pretty nasty and had a rough odor! That said, the hike up was lots of fun and there were little monkeys running around the whole way up. At the top, we found the Monkey Temple! Here is an example of one of the friendly monkeys that Brian nearly met! My mom and I (Chris) will share our thoughts on the history. So, that’s what Mom had to say. I had a different perspective that I wanted to share! That’s all for now folks! We have an early departure from the hotel tomorrow (5:00 A.M. leave hotel, 7:00 A.M. flight!).. hotel. That was unbelievable! We were packed in…wasn’t sure I was going to make it. But we did. I wish I had gotten a picture…only way to realize what this was like. Very third world fun. with each other to get position. They literally come within inches moving at 40 MPH. 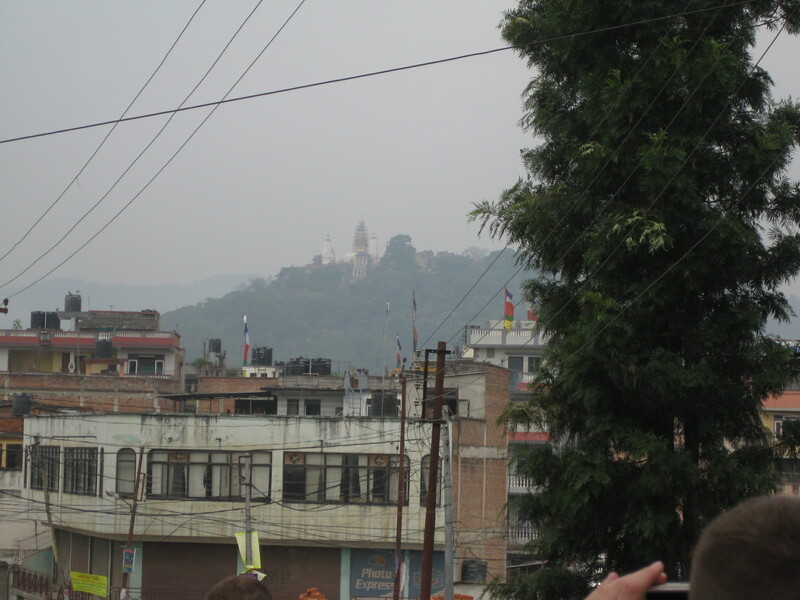 Tomorrow we go sightseeing and then prepare to leave for the mountain Wednesday. We will have breakfast at 4 and then leave for the airport to take us to our starting point. I found out we will be flying a 16 seater plane. I am jockeying for front row. Day 09: Pheriche – Rest and acclimatization day…yay!